We are thrilled to announce that we have reached the Top Ten in all relevant categories for Produced in Kent’s Taste of Kent Awards 2017! Red Love® Cider, Strong Kentish Cider and Monks Delight are all in the top ten Kent Cider or Perry of the Year category, Ortega and Gribble Bridge Sparkling Wine have been listed in the top ten Kent Wine of the Year category and Biddenden has been named in the top ten Juice Producers of the Year with the vineyard shop also in the Kent Local Food Retailer of the Year category. We would like to thank all those who have voted so far for their support, but the race is not over yet and we still need to secure as many votes as possible to reach the finals! 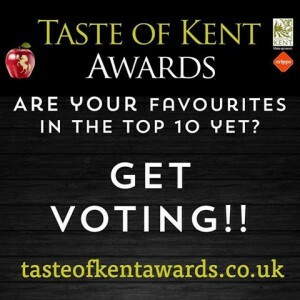 Voting closes on 3 January 2017 so there is still plenty of time to submit via the website tasteofkentawards.co.uk or if you are popping into the vineyard shop for a spot of Christmas shopping please ask a member of staff for a submission form. If you have voted already please do encourage your family and friends, neighbors and colleagues, or anyone who you’ve enjoyed a glass or bottle of Biddenden with in the past 12 months.